It’s a thriller that doesn’t quit. From his serene parish in Lincoln, Rhode Island, Father Richard Merrill had led a seemingly quiet life as a man of the cloth, shepherding his flock toward the solace of a higher power. Now, the core of his beliefs and his being is propelled into the darkest chaos. What’s more, it’s all for the sake of his very own flesh and blood, two sons who were long ago given up for adoption. Their mother, Francoise Dupont, a former gallery director at the Louvre, has since married an Arab prince. And herein lies the trouble. The bloodlines of the sons place them in line to succeed her gravely ill husband, now the king. More than a few of the king’s enemies are consumed with stopping them from ascending to the throne. With help from the FBI, the CIA, and an aging mercenary, the race is on. From France to Haiti, the United States, and the Middle East, Merrill will take whatever measures necessary to save his sons and unmask the scent of the Flower of Heaven. 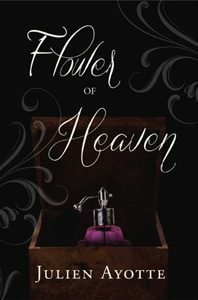 With evocative detail, high-flying action, and ingenious plot twists, Flower of Heaven is a searing =, brilliantly crafted literary debut that will keep readers hungry for every enthralling page. It’s a heart-stopping work that spans continents, while mining the deep channels of the human heart. I have known many priests in my life, and they are no different than most other men. Their commitment to being celibate is often tested throughout their careers as priests, and they falter is staying true to this commitment as other men fail to be true in their marriages. I wanted to show people that priests are human, and humans make mistakes in life. You just don't expect the mistake to come back and haunt you thirty-five years later. The courage of a woman fighting for womens' rights, and the strengths of a priest to accept responsibility for his action, are themes worthy of giving to readers. My experiences with priests helped me to identify one that I believed would falter on one occasion, but rise to the call when needed. The French woman involved, goes from a life of adversity to one of fame and power, stumbling badly along the way, and hoping to remove the torment it has caused in her new life of royalty.